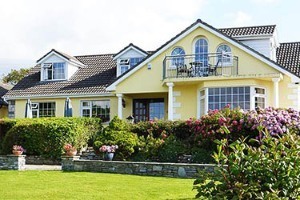 The backbone of the Irish accommodation sector is the 'B&B' - generally an Irish family home that offers a room for the night and breakfast the following morning - each one is differentiated by the personal touch of the owner. There are 105 Irish B&B Owners Association members on the Ring of Kerry and these B&Bs are the best place to stay on the Ring of Kerry. This website allows you to Book Directly missing out the middlemen or online travel agent fees, thereby providing you with the very best value and comfort. During busy periods when rooms becomes scarcer, you may find it useful to use our B&B Directory that lists 323 B&Bs. 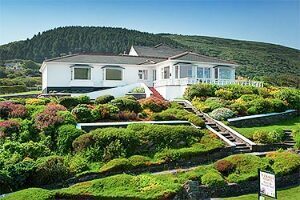 Brigadoon House is situated on the Dingle Peninsular, overlooked by the Sleive Mish mountain on one side and the highest mountains in Ireland, the McGuillicuddy Reeks, on the other side. Separated by the estuary on which Inch beach lies 10 minutes away. 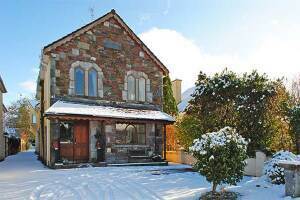 This beautiful location is central to Killarney, Tralee and Dingle with the Ring of Kerry a short drive away. We are also home to a multitude of world class golf courses. Beautiful scenery, pleasant surroundings and luxury accommodation. 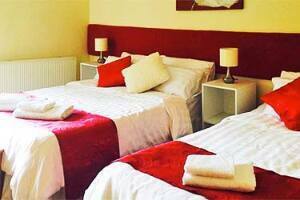 Our rooms can cater couples to families, to large groups. Our family rooms have a double bed and 2 singles bed with the option of an additional bed. All our rooms are en suite featuring a power shower in each bathroom, complimentary toiletries and towels. Rooms are serviced daily and fresh towels are provided each day. We have tea and coffee making facilities in each room, with hot chocolate and biscuits for the children! All rooms have a flat screen TV and complimentary wifi throughout the house. Each room has a French door leading to the gardens where tables and chairs are provided for you to relax and unwind in the evenings. Breakfast is served each morning with a wide selection of items from a full Irish breakfast to a fresh fruit smoothie, homemade scones and soda bread. We endeavour to make you feel welcome and we aim to give you a home from home, where you can relax, recharge and feel refreshed. 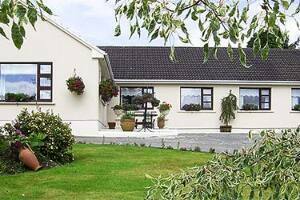 This picturesque bungalow, offering B&B, is situated in a peaceful and restful area off the Tralee to Killarney road. Hilton Heights B&B has panoramic views of Killarney's beautiful mountains and is surrounded by scenic countryside. Breakfast includes a choice of Full Irish (Bacon, sausage, tomato, hash brown and egg), Wild Irish smoked salmon with scrambled egg, homemade pancakes with maple syrup, fruit salad, porridge or omelette along with a selection of juices and cereals. Our home is convenient to Kerry Airport, the National Park, the Ring of Kerry and Dingle Peninsula, making it the perfect base from which to explore the spectacular beauty of Kerry. Tours can be arranged. Only 10 minutes drive from Kerry Airport. From Killarney take the Tralee road for 7 kilometers, turn right at the sign onto the L3009 road. We are on the left hand side of this road. 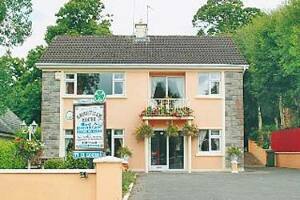 Situated on the Wild Atlantic Way near Kenmare. Oakfield B&B accommodation is a 4 star family run home, situated 5Km along the R571 road near the well known Heritage town of Kenmare. The town is noted for its award winning Restaurants and craft shops. Irish music is played most nights in the bars and restaurants throughout the town. Oakfield B&B offers a choice of Double/Twin and Family rooms. All rooms have en suite bathrooms with power showers. There is a full extensive breakfast menu with local smoked salmon and home baking. All breakfast are cooked to order. Ideal for touring the Gap of Dunloe, Killarney National Park, the famous Ring of Kerry or the rugged Ring of Beara with its stunning views. For those who like to walk and do a little hiking, the beautiful Gleninchaquin Park is worth exploring. Golf lovers, we are located near some of Ireland's finest golf courses such as Kenmare, Ring of Kerry and Killarney. We are sure your stay at Oakfield will be pleasant and relaxing. Easy to find and hard to leave. Cul Draiochta is a purpose built spacious bed and breakfast. It is a family run business, where Ann and her family spare no effort to ensure that you enjoy traditional Irish hospitality and personal attention at all times. Cul Draiochta is fully equipped with every modern convenience to make your stay more pleasurable. Irish tourist board approved, Recommended by Guide de Routard, Dillard & Cousin & Brittany Ferries. All diets catered for by our qualified in house chef. 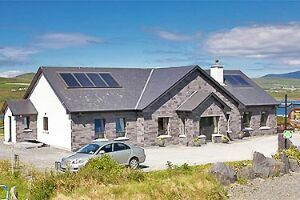 At this modern guesthouse the emphasis is on relaxation with a superb location on the Ring of Kerry and magnificent views from all bedrooms. Close to the Kerry Way with miles of safe, unspoilt sandy beaches and subtropical vegetation in Gulf Stream climate close by. All rooms are with en-suite bathrooms, large bedrooms with big beds, choice of breakfast and free packed lunch available when staying two days or more. Pick up from Kerry Airport can be arranged. Cahergal & Leacanabuaile Stone Forts - Ballycarberry Castle and the famous Skellig Rocks - Walking tours of Kerry Walk all year round - Cycling - Golf - 18 hole championship course - Sea and shore angling - many species - Trip to Skellig Michael arranged - Diving - tuition available - Horse Riding - Canoeing and Sailing - Swimming - Best seafood restaurant - Ideal for artists - spectacular sea & mountain views can be painted from our patio. 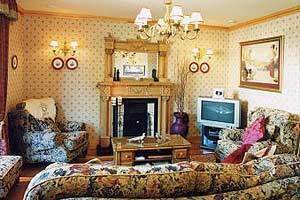 Just 40 metres from the vibrant Town Centre of Killarney, the Copper Kettle is one of Killarney's most central and luxurious town guest houses. It is an ideal base from which to visit Killarney National Park, the Ring of Kerry and the Dingle Peninsula. All rooms have multi channel TV, direct dial telephone, WiFi internet access and ensuite bathrooms. Also available (on request) are exclusive jacuzzi suites and kingsize beds. Your hosts Shelley & James O'Neill hope to extend a Cead Mile Failte to you on your arrival to Killarney. Simply unrivalled with contemporary furnishings and gentle relaxing hues, contrasting woods coupled with luxurious accommodation, breathtaking views and completely run on alternative energy (solar and geothermal, under floor heating) - all make this guest accommodation genuinely unique. Luxuriously styled furnishings and detailed, use of native slate from one of the worlds most renowned slate mines. Valentia Slate makes this a special haven that you will find hard to leave. All rooms have a wall mounted moveable LCD TV to watch whether in bed or on the couch by the window, Sky Satellite, Tea/Coffee facilities, hairdryer, power showers (some have shower columns with body jets) even the chocolate on your pillow as standard while phone and internet are by request. The Geothermal heating, which is thermostatically controlled, can be adjusted to suit by you in your room. Our 4 star guesthouse boasts 15 luxurious bedrooms with private bathroom, TV, direct dial telephone, power showers, trouser press. The house is tastefully decorated throughout and features many interesting antiques and art. All guestrooms are spacious, en-suite with direct dial telephone, television and trouser press. The accent is on friendly personal service backed by the highest standards throughout. 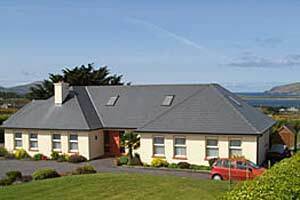 Abbey Lodge is close to Killarney Town Centre, a good base for touring the Ring of Kerry or exploring the Killarney National Park and convenient for the INEC - just a short distance along the Muckross Road.